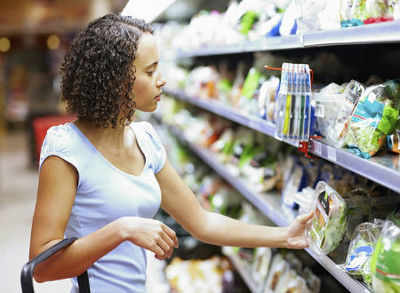 The label on a packaged snack may not always give you the authentic information on whether the food is good for your health. For example, a popular health drink claims it contains “pro health vitamins”, but the label suggests that it has 71 gms of sugar for every 100 grams.This sugar content is actually 57% of the recommended daily intake limit. A new study by Centre for Science and Environment (CSE) released on Friday reveals how several popular brands of snacks, health drinks, cooking oil and noodles don’t tell you what you must know. A brand of health drink that claims it has “34 vital nutrients, 100% milk protein, more protein faster growth” actually contains sugar as high as 38% of recommended daily upper limit per serving. “In fact, we have not accounted for the fact that a person may consume it more than once and add sugar to the drink,” said Amit Khurana of the food safety and toxins programme at CSE. Equally misleading are the advertisements – a brand of digestive biscuits, which claims to have less refined flour (maida) was, in fact, found to contain more maida than whole wheat, according to Advertising Standards Council of India (ASCI). More such complaints sourced by CSE suggest several brands make claims in advertisements that have no substance. An oil brand that claims to contain “antioxidant powder” and suggests it is the “healthiest choice for your heart” allegedly violated the norms laid down by Food Safety and Standards Authority of India (FSSAI). Moreover, ASCI is a “self-regulatory” body , which does not have the power to impose punitive measures due to which violators may repeat the same offences. According to the report, the labelling requirements in India are extremely lax. The Food Safety Regulations, 2011 make it mandatory for the brands to declare energy, protein, carbohydrate and fat content. The quantity of sugar is to be specified as well. Readers can find the brand names in a report published on the CSE website.